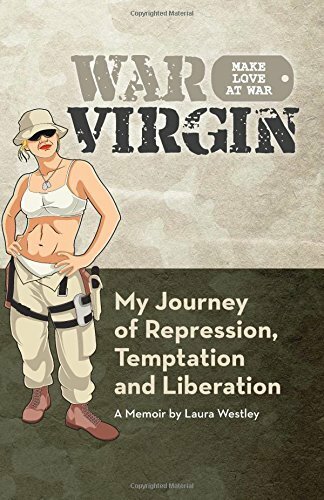 War Virgin: My Journey of Repression, Temptation and Liberation. Poets and playwrights have been writing about virgins for centuries. But until now, I don't think anyone has written about being a virgin in a military environment, battling not only the enemy, but battling virginity itself. I guarantee you that Laura Westley will grab your attention on the very first page of her memoir. You may be shocked. You may be amused. But you will want to turn the page to see what the hell this woman, this virgin, is going to do next. She is upfront, in your face, and very personal in revealing her experiences as a virgin in the military. Throw in growing up with a demeaning father, completing four demanding years of soldierly at West Point, and serving a combat tour in Iraq during Iraqi Freedom, and you have the makings for an interesting memoir. Sprinkle in some humor, some sadness, some unpleasantness, and a whole lot of foreplay, and you have a book that you won't be able to put down. And if you still haven't gotten enough, there is also War Virgin, the Play. My wife and daughter saw the play, while I watched the grandchildren. Before seeing the play, my daughter read the book from cover to cover nonstop, continuing on while her children slept. Before the book was published, and before my wife saw the play, my wife listened to Laura Westley speak at a political luncheon. Afterwards, she "suggested" I invite Laura Westley to be guest speaker at a meeting of the Florida Bibliophile Society (I'm the VP). I know when to take orders. So on June 6, 2016, I cordially invited Laura Westley to be our guest speaker during National Women's History Month in 2017. And she readily accepted our invitation. Laura Westley, author and playwright of War Virgin, will be the keynote speaker at the meeting of the Florida Bibliophile Society at 1:30 pm on Sunday March 19, 2017 at the Seminole Community Library, 9200 113th St. North, Seminole, Florida, 33772 Admission is free. But just a word of advice: don't bring your Sunday School teacher with you! Samuel Johnson once instructed James Boswell (1740-1795) to surround himself with books. And at Auchinleck, James Boswell surrounded himself with books acquired by his grandfather James Boswell (1672-1749), by his father Lord Auchinleck (1706-1782), and by books that he himself acquired. And after his death, his sons Sir Alexander Boswell (Sandy) (1755-1822) and James Boswell the Younger (Jamie)(1778-1822) added a few thousand more books to the Auchinleck Library. 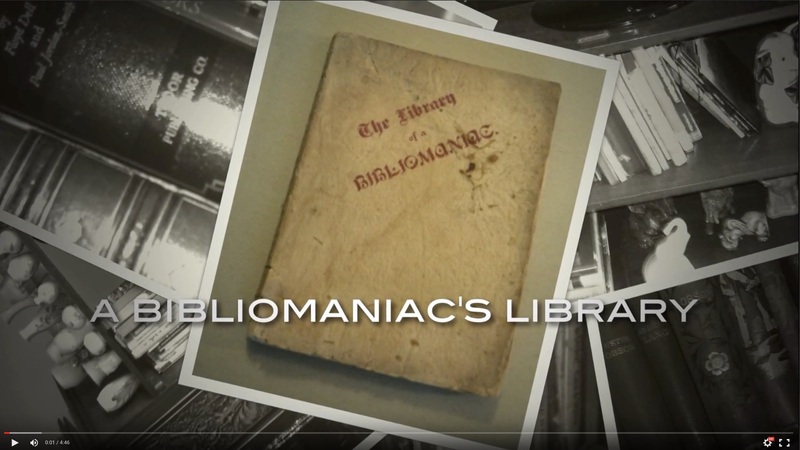 And now, with Boswell's Books, Terry Seymour provides an extensive book-by-book reconstruction of the Boswell Library. Yes, that's Samuel Johnson raising a folio above his head in the cover photo above. But that's not the bookseller Thomas Osborne who is about to be bashed. It is Lord Auchinleck. And that is James Boswell himself cringing in the background. The etching, "The Contest at Auchinleck," and part of Rowlandson's 1786 Picturesque Beauties of Boswell, offers a contemporary view of the Auchinleck Library. I am well acquainted with the books in the Auchinleck Library. While Terry Seymour was researching, cataloguing, and gathering information for his book, I was leading a parallel cataloguing project on the social media website, Library Thing: the online cataloguing of the library of James Boswell. And Terry Seymour was one of our Auchinleck Advisers. James Caudle, the Associate Editor of the Yale Editions of the Private Papers of James Boswell, was Terry Seymour's primary adviser for his book. In fact, he is the author of the preface of Terry Seymour's book. And he was the primary adviser and chief supplier of catalogues for the Boswell Cataloguing Team on Library Thing. The Boswell Cataloguing Team began cataloging the Boswell Library in October 2008. And we completed our cataloguing in August 2012. But in June 2013, thanks to an article by Terry Seymour in the March 2013 issue of the Johnsonian News Letter, "An Appendix to Boswell's Books," I was recataloguing the 1810 Catalogue of Greek & Latin Classics in the Auchinleck Library; I was adding eleven items I had somehow missed two years earlier. Terry Seymour began his Boswell project sometime in 2009. And his book was published in April 2016. I received my copy on April 20th. Terry said I was the first collector to receive an ordered copy. I had volunteered beforehand to be a reviewer (to get a free copy), but Terry believed–and rightfully so–that my name and the name of Library Thing were mentioned too many times in his book for me to write a fair and impartial review. What I can do, however, is tell you a little bit about both cataloguing projects. The purpose of the Library Thing Catalogue of James Boswell was to provide online access to the individual listings of books formerly owned by James Boswell and his family. 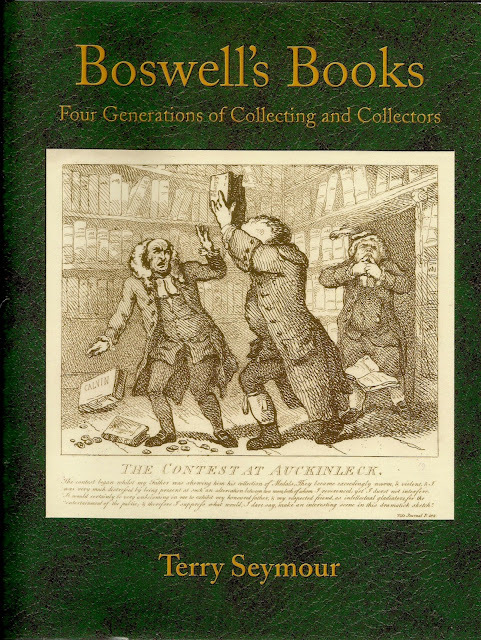 The purpose of Boswell's Books, as stated by the author, "is to present a complete picture of the known history of each book, from the time it entered the Boswell family library until the present day." The Library Thing Cataloguing Team began by cataloguing books listed in the 1825 Action Catalogue, and then those books listed in the 1893 Auchinleck Catalogue. Most of the books in the 1825 catalogue were formerly owned by Jamie Boswell. And most of the books in the 1893 catalogue were formerly owned by Lord Auchinleck. The cataloguing team then catalogued the books listed in the 1810 Catalogue of Greek & Latin Classics in the Auchinleck Library, the 1916 James Boswell Talbot Sale, the 1917 Dowell Sale, the Circa 1770 Catalogue of Books Belonging to James Boswell, and Curious Productions, a collection of chapbooks James Boswell acquired in 1763. The 1810 Catalogue contained Greek and Latin books that Sandy Boswell inherited from his father, and Sandy was the cataloguer. 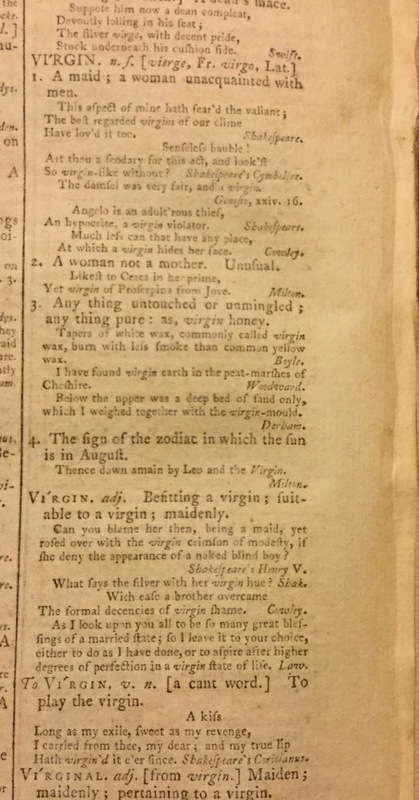 James Boswell himself was the cataloguer of what I cite as the "Circe 1770 Catalogue." Terry Seymour cites it as the "JB Handlist" c1771. The 1916 sale contained items that were not listed in the 1893 auction. The auctioneers of the 1917 sale combined remainders from the Auchinleck library with items from other libraries. Terry Seymour's catalogue, Boswell's Books, contains not only the books, but also the manuscripts that are listed in the above catalogues, but with one exception. The 1825 Catalogue contained a number of Jamie Boswell's books that were formerly owned by Edmond Malone. And Terry Seymour catalogued only those "books that have a direct bearing on their Boswell owners." Terry Seymour referenced a number of additional sources when he catalogued the books and manuscripts listed in Boswell's Books: Margaret Montgomerie Boswell's Inventory of the Auchinleck Library 1783-1785, Sandy Boswell's Catalogue of the Manuscripts at Auchinleck 1808-1809, fragments of Sandy Boswell's Catalogue of the Auchinleck Library 1803-1810, the Walpole Galleries Sale of 1920, and the 1976 Family Sale. Terry Seymour also listed presentation copies given by the Boswells to their friends. Margaret Montgomerie Boswell was James Boswell's wife. And shortly after Lord Auchinleck's death, she catalogued the books and manuscripts as they appeared on the shelves in the Auchinleck Library, identifying the books by the titles on their spines. The first part of the catalogue, however, is missing. Sandy Boswell's catalogue of the manuscripts identified 89 manuscripts in the Auchinleck Library. Terry thinks it is likely that this catalogue was intended to be part of Sandy's General Catalogue, of which no complete copy exists. Terry Seymour says that the 1920 Walpole Sale included more books with Boswell ownership marks than any other source. And the identity of the prior owner remains unknown, and also how the owner acquired the books. Of the 400 lots listed in this sale, only 12 lots appear in any other source. As for the 1976 sale, Terry Seymour notes only two books of merit in the sale. By far, the greatest accomplishment of Boswell's Books, in my opinion, is Terry Seymour's identification of many of the 436 items sold in the 1893 Auchinleck Sale that were not identified by title in the auction catalogue. These books were tabulated under the dreadful phrases of and others and and another. Terry Seymour searched high and low and acquired the contemporary bookseller catalogues of the three biggest buyers of the 1893 Auchinleck Sale: Bernard Quaritch, William Ridler, and Pickering and Chatto. Using these and other contemporary bookseller catalogues he acquired, he identified many of the and others of the 1893 Auchinleck Sale. I will reveal here, particularly for those Boswellians and scholars residing in the state of Florida, and for those booklovers who want to know more about the Boswell Library and Boswell's Books, that Terry Seymour will be the guest speaker at the January 15, 2017 meeting of the Florida Bibliophile Society. I call to mind Nicholson Baker's article, "Discards," from his book, The Size of Thoughts." This article, which first appeared in The New Yorker, detailed the initial conversion of library data from library cards to online library catalogues in the 1980s and 1990s. At most libraries, only the bibliographical information on the front of the library card was transferred. And when the library card was discarded, the provenance information, if recorded on the verso of the card, disappeared. America's great libraries are scrapping the card catalogue in favor of the more accessible on-line system, and many librarians are toasting the demise of the dog-eared file card and the bookish image it projects. But are they destroying their most important––and irreplaceable––contribution to scholarship? Now in many libraries, Special Collections has either retained or restored provenance information. But I wonder how many libraries have Boswell books in their library stacks that they no longer know about? I'm slowly adding a shelf or two of children's books in my library for my grandchildren to read when they visit. But I may have trouble keeping this book in my library. My wife believes at least one of the grandchildren will want to do a book report on it. 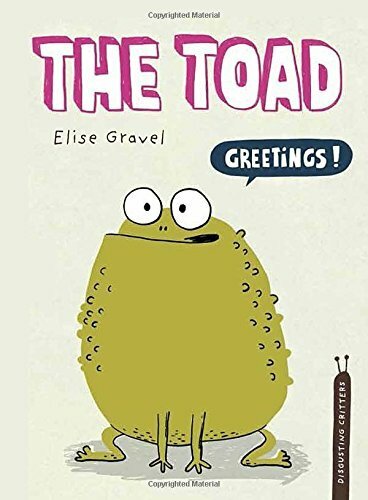 The Toad is part of a series of books by Elise Gravel about Disgusting Critters. And I do mean disgusting! Just look at the titles: The Worm, The Fly, Head Lice, The Slug, The Rat, The Spider, and The Toad!. But kids don't find these critters to be disgusting. And Elise Gravel presents the toad as friendly and useful for the environment. And she adds a little humor in the book, which will make my granddaughters laugh. One of them will even say, "Again..."
I may have to get most of the other books in the series for my library–except for the book about head lice! That would make me scratch my head! by George Genovese with Dan Taylor. I loved playing baseball as a kid. I loved watching my kids play baseball. I loved umpiring baseball games: Little League, Pony League, High School, Mexican League. I love watching baseball games on TV. I love going to baseball games. And I love reading books about baseball. This book, A Scout's Report: My 70 Years in Baseball, is one of the better ones. 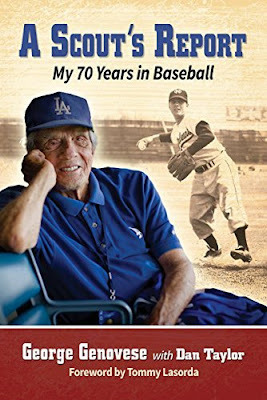 From Page 1 to page 244, you will witness George Genovese reliving and breathing baseball, first as a player, then as a manger, but mostly as a baseball scout. 44 of the players George Genovese signed became major leaguers and, when you read his book, you will find out which ones went on to become stars. It was in early December, right after the San Bernardino shooting, that a Facebook friend of mine posted a comment about the need for gun control. 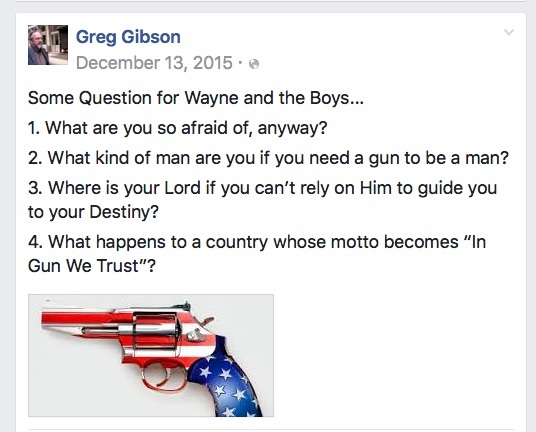 One of the people who responded to the post was Gregory Gibson, an antiquarian bookseller who wrote a book about his own son's murder–a mass shooting at Simon's Rock College, Great Barrington, Massachusetts on December 14, 1992. I ordered a copy of his book on the 5th of December, and it arrived a few days later. Now I have read true crime books where the writers investigate the murder and the murderer, and while I can't say that I enjoy reading them, I do find them to be interesting reading. But to read a book written by a father about his own son's murder—that was something I didn't know if I was prepared for. Read it, I did, over the holidays. But review it, I could not. I was at a loss for words. What do I say about a father who writes a book about losing his son to gun violence? Good book? Compelling reading? It would take months before I wrote this review. Gregory Gibson wanted to know the "how" and the "why" of his son's murder. He attended the trial. And afterwards, he investigated the murder on his own: How, when and where the murderer, a student at Simon's Rock College, obtained the murder weapon, an SKS Chinese Type 56 Carbine, which accepted a thirty-round magazine. How the killer modified the gun. What the killer did on the day of the murder. The actions and inactions of the officials at Simon's Rock College on the day of the murder concerning the killer's receipt of his mail order ammunition. Gregory Gibson went so far as to interview the court psychiatrists, the witnesses to the shooting, the shooter's parents, and the shooter himself. He researched the history of the manufacture, importation, and modification of the murder weapon itself–the killer modified the gun and replaced the ten-round magazine with a thirty-round magazine. This magazine did not lock into place, causing the gun to jam. If not, there would have been more victims than there were. 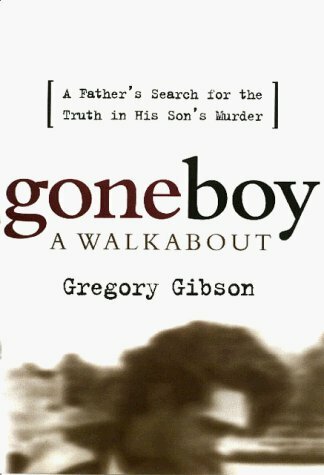 Seemingly, Gregory Gibson looked into anything and everything pertaining to his son's murder to try to understand and answer one question: Why? The 'arms' that the founding fathers thought about keeping and bearing didn't need defining in 1800. America needs to respond to that last question. And now. This is one of them books where there are two sides to the fence. If you're Irish and damn proud of it, The Seven who led the Easter Rising in 1916 are heroes. If you're English, then these seven men were traitors. Now I'm Irish and proud of my heritage; but what disturbs me is that The Seven collaborated with the Germans, and sought Germany's help in their rebellion against England. Since America was fighting against Germany, the patriotic lines become blurred. 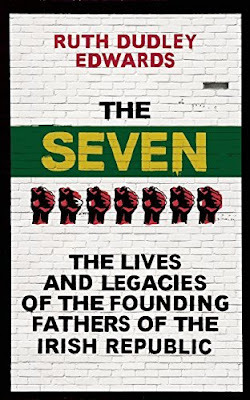 And I personally can't see The Seven as the patriotic heroes that many Irish men and women regard them to be. 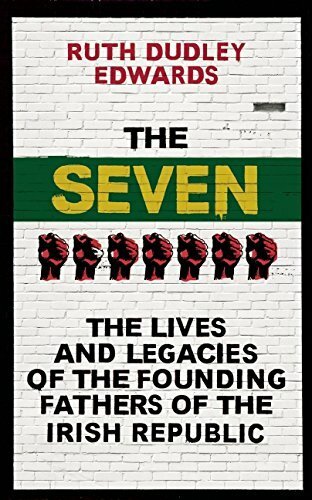 Ruth Dudley Edwards lays it all out matter of factly: the individual backgrounds of The Seven, their parts in the Easter rising and their legacies. An interesting read. I regard myself as quite knowledgeable about bibliophiles and bibliophilic matters. But I learned a thing or two from reading this book. 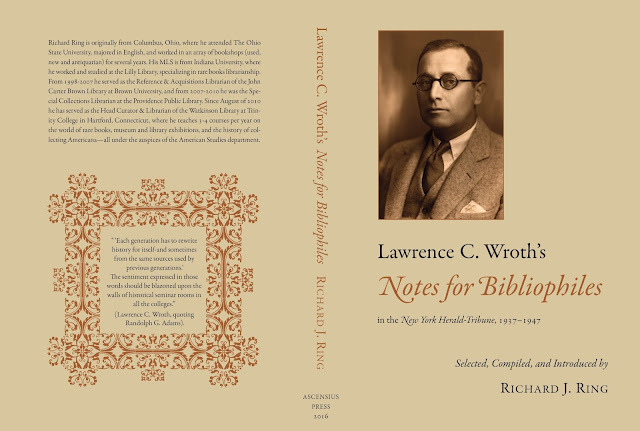 I learned more about the bibliophiles I thought I already knew: Wilberforce Eames, Douglas McMurtrie, and A. S. W. Rosenbach, to name a few. And I was introduced to a bibliophilic topic I knew practically next-to-nothing about: maps. Richard Ring selected articles by Lawrence Wroth about mapping the Northwest Territory as well as the maps of the Pacific Battleground, where American troops were currently fighting. And I particularly enjoyed reading Wroth's pieces about the American libraries, their exhibitions, and some of their special collections. And Ring included pieces on American newspaper bibliography, printing, and even on early American handwriting. What amazed me most about the book, however, was the depth of knowledge Wroth displayed about the location of copies of particular books and maps in the libraries of the world. And, I should note, Wroth had no computer on which to look up the bibliographical information he provided in "Notes for Bibliophiles." Richard Ring has done well in his selection of the 59 articles from the more than 225 articles that appeared in the New York Herald Tribune Books. I wrote this piece for The Florida Bibliophile, the official newsletter of the Florida Bibliophile Society. I am posting it on this blog to share it with my other bibliophilic friends. There are literally hundreds of people, many of them bibliophiles, who called Paul Ruxin their friend. He was a member of the Caxton Club, the Rowfant Club, and the Grolier Club. And he was the guest speaker for many of the other bibliophilic societies in the United States, including the Florida Bibliophile Society. His death has shocked us all. I posted a notice of Paul Ruxin's death on the Facebook page of the Florida Bibliophile Society. 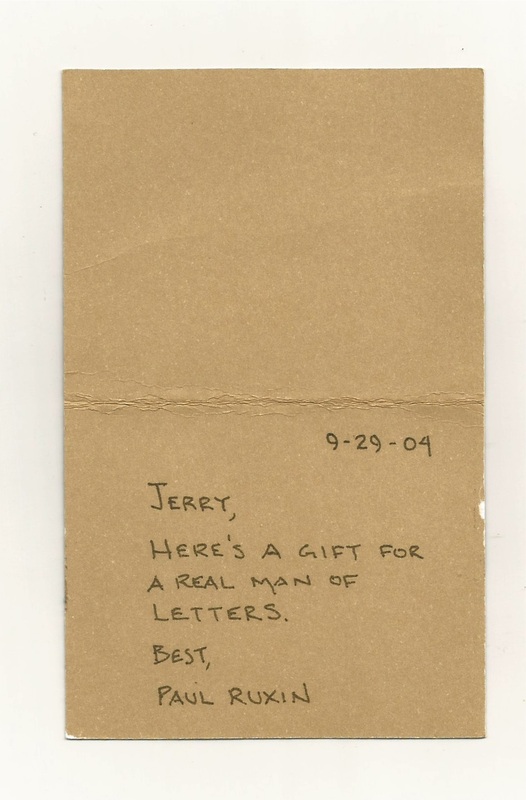 And I included an anecdote of how I first made his acquaintance in September 2004. For those FBS members who didn't read my Facebook post, I will repeat the anecdote below. And I will add a few more anecdotes to show the kind of man my friend Paul Ruxin was. In September 2004, Lee Harrer, a member of both the Florida Bibliophile Society and the Caxton Club, gave me a copy of the latest issue of The Caxtonian, which contained an article by Paul Ruxin titled, "Other People's Books: Association Copies and Another Pleasure of Collecting." Lee knew I'd be interested in reading the article because I, too, collected association copies. I wrote Mr. Ruxin, introduced myself, and said I collected association copies and Samuel Johnson—but on a mailman's salary (Paul Ruxin was a partner in the prestigious Jones Day Law Firm). I told Paul that I was about to buy a copy of his book, Friday Lunch, because I was going to begin giving talks before the Florida Bibliophile Society, and hoped to learn a thing or two by reading the talks he gave before the Rowfant Club during lunch on Fridays. Paul promptly responded and wanted to know where I had found a copy of his book. He said he was looking for copies to give to some of his friends. I gave Paul the bookseller's contact information and told him to buy it for one of his friends because at $75 it was really too rich for me. And I thought that was the end of the matter. I "surprised" Paul Ruxin a few months later. One of the twelve talks published in Friday Lunch was about the poet and playwright Archibald MacLeish. I had just read MacLeish's essay "The Reorganization of the Library of Congress 1939-44, " in the 1945 Annual Report of the Librarian of Congress, and when I found an offprint of the article on AbeBooks, I thought Paul would enjoy reading it. I ordered it, and had it sent directly to Paul Ruxin's place of residence in Chicago. Paul received the pamphlet but he didn't know who to thank! There was nothing on the invoice that identified who bought the pamphlet for him. So Paul called this friend and that friend, and yet another friend—Paul had lots of friends—but, thus far, no friend admitted to sending him the pamphlet. About two weeks later, I emailed Paul and asked if he received the pamphlet I sent him. And he replied, "SO YOU'RE THE ONE!!" Chicago was cold and windy in 2005, and Paul accepted my invitation to be the guest speaker for the March meeting of the Florida Bibliophile Society. He planned on spending a week or so just soaking up the warm Florida sun after he gave his talk to us. "Soft-Hearted Sam" was the title Paul had selected for his talk. A day or two before the meeting, however, Paul contacted me and said he had to change his plans. He would fly in the day before the meeting; but he had to fly back to Chicago right after the meeting was over that Sunday. And that's what happened. Afterwards, I learned that Paul had been in the middle of negotiating the sale of an oil company, and had to get back to Chicago to resume negotiations on Monday. To me, that said a lot about what the word, commitment, meant to Paul Ruxin. I had invited Paul to brunch at my house before the FBS meeting in March 2005. We spent more than a few minutes beforehand in my library, mostly in front of the shelves containing the books formerly owned by Donald and Mary Hyde. Paul remarked to my wife that I was lucky to have an entire room for my books. He said that all his wife let him have was one small alcove for all of his books! I had the opportunity to visit that "small alcove" in March 2011. I was in Chicago for the Caxton Club's Book-Launch Party to celebrate the publication of Other People's Books: Association Copies and the Stories They Tell. Both Paul and I had contributed essays which were published in the book. As for Paul's alcove, after seeing it, and fondling handling some of his books on the shelves, I regarded it as a great alcove! There were books formerly owned by Samuel Johnson, James Boswell, and their contemporaries—all of them looking down and out over Chicago. At thirty-eight floors up, Paul's Great Alcove of Books was the closest I have ever been to book heaven! I last heard from Paul on March 21st of this year. I had sent him the link to my recent blog post, "The Story of Spence's Anecdotes." And after reading it, Paul replied, "Fascinating as usual... thanks." To you Paul, I say with all my heart, "Thanks for being my friend."